Contrary to the widespread stereotype that Colombians are very inviting, my experience is that one is not often invited to the home of friends. It is rather common to meet in a restaurant or café. This was rather surprising to me but probably reflects the individualistic way of living in a big city of some eight million people. If you want to learn Spanish, you should definitely consider to come to Bogotá. People speak very clearly and not too fast. It allowed me, who is not a genius in languages at all, to learn the language in some six months, without any knowledge of Spanish beforehand. What is really useful is when your partner is Colombian and you can practice the language every day. Colombian people are just so beautiful! The mixture of an indigenous, African, and European influence is just making sure to provide for many of the most astonishing faces I have ever seen. Most Bogotanos are very critical about their city. In almost Viennese terms, so far for me the role model of constant complaints, people are criticizing anything one can imagine. Yet, as a foreigner you are not supposed to join, criticizing the city is rather the privilege of the natives of the city. It is also interesting that usually someone else is responsible while there is little critical reflection about one’s own role. While Colombia has indeed a huge variety of music to offer, almost all taxis and popular restaurants offer just one type: vallenato. All clubs after a certain point of the night will surely play reggaeton music, often with very sexist lyrics. Both types of music are not particularly enjoyable for me. 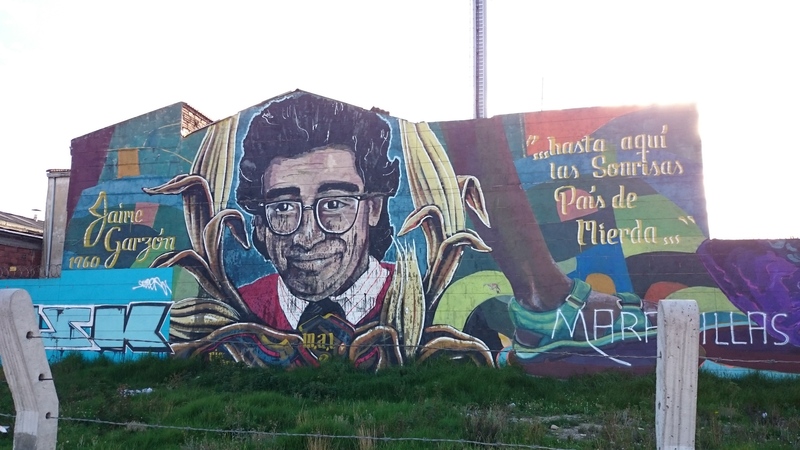 Bogotá also has a great graffiti culture. Traffic is indeed a challenge. While for some 15 years, Bogotá has a rapid bus system called Transmilenio, there is a metro missing to deal with all these millions of people who try to move. Consequently, it seems that almost any hour of the day there is rush hour and inside the public transport system one is often very squeezed. I don’t know how people get their driving license, but for the most part I am just scared of cars and motorbikes. Although I am using my bicycle every day, I am afraid to say that the same goes for bikers as well as no rules seem to exist. What is great though is that the city offers 300km (!) of bike lanes. Colombia is known around the world for its armed conflict and drug trafficking. The consequence is a perception that it is a very insecure country, a feeling that ironically is very much shared by almost all Bogotanos I know. Yet, I feel totally safe here, even walking alone during the night. Being a foreigner you have a lot of advantages. My experience at work, in restaurants, in shops, or on the street prove that I constantly get preferential treatment. While I enjoy it, I also wonder how much colonial heritage is still out there of how Europeans (oh well, just gringos) are perceived. 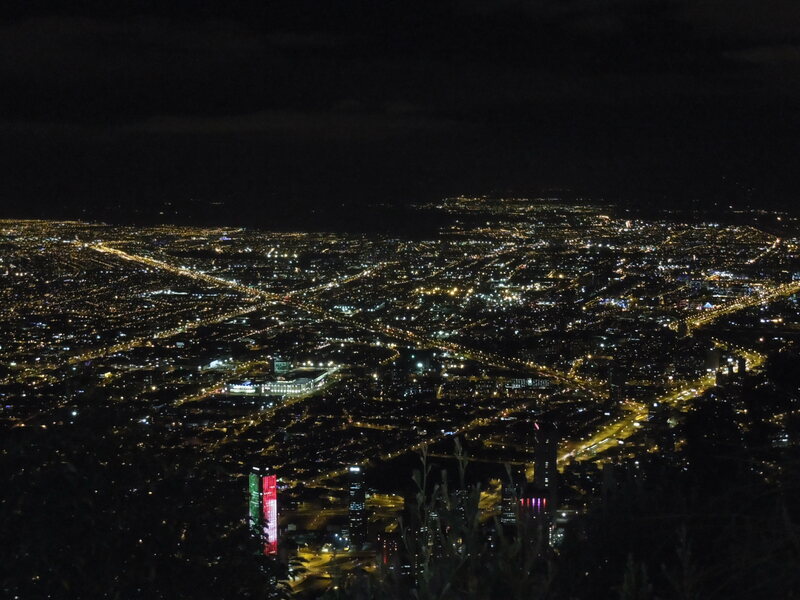 Bogotá by night from Monserrate. Bogotá in many ways is also a monster. The city has grown from a population of 500,000 in the 1950s to more than eight million. City planning was always lacking behind the actual expansion of the city. Architecture for the most part is not very exciting and often lacks a soul. While some areas have parks, in other areas you will find nothing else than houses. For tourism purposes, Bogotá does not offer a lot. There is the spectacular gold museum and Monserrate. But that is pretty much it. There are of course other museums, some streets in the old town are quite nice but the city center is still very run down. You are pretty much done in one day. Luckily enough there are many other touristic possibilities around Bogotá though, although it requieres a two to four hours drive. One of the things I love most are the fresh vegetables and fruits. In contrast to many supermarkets in Europe or the U.S., they are indeed fresh and the variety is just so big. And the best part of it: fresh natural juices. 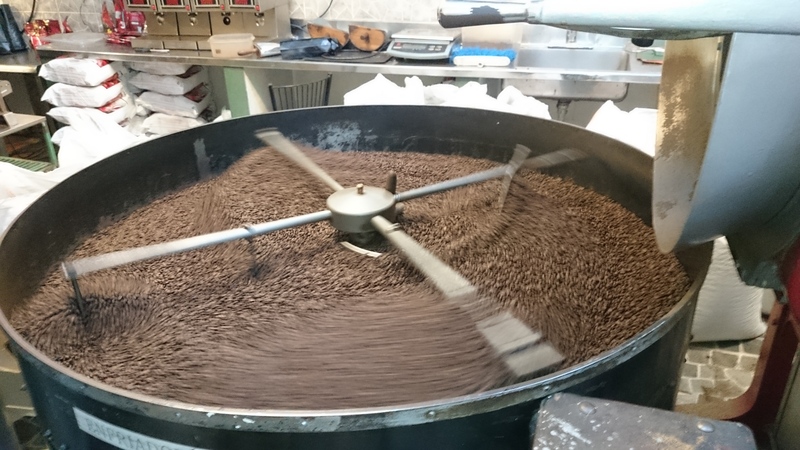 Colombia is known for its world class coffee, and rightly so. Until today I struggle with is the lack of punctuality. Although I should be used to it from my East African experience, for some reason I have a harder time here in Colombia. Everything starts late, everything. And afterwards everyone is wondering why there was not enough time available for the meeting, conference, or whatever else. The only thing I would miss from Austria (besides family and friends) is bread and cheese. The regular bread that you get is way too soft and does not have much taste, while cheese is usually white and not very ripe. I just don’t get accustomed to the taste. Both items might not be particularly related to Colombia, because the same happened in the U.S. or Eastern Africa. While for all places where I have lived so far, it was important for people to know whether or not one likes it, I have never been asked so often whether or not I like it here. And I never have felt so much pressure to answer positively to the question. One of my favorite activities is to use Bogotá’s ciclovía. They close the main streets from 7am to 2pm and is only available for bicycles, dog walkers, roller bladers or joggers as myself. It is really a space where residents can reclaim public space. Every country has its issues with bureaucracy, but Bogotá (or Colombia in general) seems to have a Kafkaesque bureaucracy. It really doesn’t matter if a rule makes sense, but when you deal with an administrator you just have to follow it. While so many things in real life are indeed quite flexible, there is a tremendous inflexibility about rules. 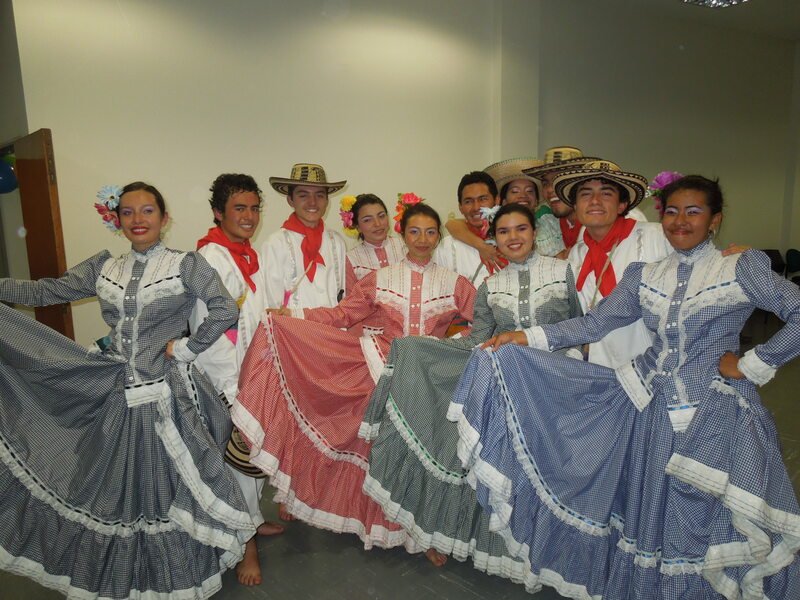 A traditional dancing group at the National University. A big surprise is the climate. As Bogotá is close to the equator, many of my friends assume it is hot all the time. Yet, as this megacity is located 2,600 above sea-level, it has in fact all the time between 15-19°C during the day and 7-10°C during the night. Almost every day it is raining at one point, so you better have your jacket or umbrella with you to be prepared. Moreover, one should be prepared to sit in a living room where everyone has a jacket on because heating systems do not exist. I assumed that Colombians are a very conservative society. However, I was very positively surprised to see that there is a strong LGBTI community in Bogotá that has no problems to have their annual pride. Their constitution is very progressive and at least in Bogotá there is a modern and progressive society on the rise. And yet, Colombia is a very divided society as well as the recent referendum on the peace agreement proved. 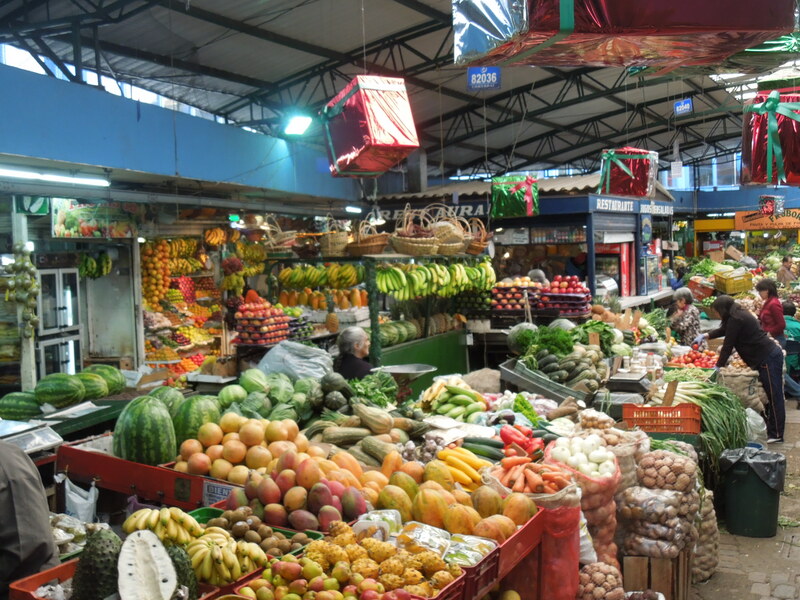 At the biggest market of Bogotá. People work way too much. In general, there is a 48-hours week and additionally many people spend additionally 2-4 hours on a daily basis in traffic. No wonder that many people are quite tired. It is also not productivity that matters for most employers but rather the time that one spends in office. I am lucky that my employer thinks differently. You will have a hard time if you don’t speak Spanish. I assumed that I will easily come by with English when I came here in October 2013. However, even well educated people often have low levels of English. Only now I really appreciate what good coffee actually means. I can’t believe that I wasted some 15 years of my life beforehand (or ever since I drink coffee) on brews that are not worth a sip. Always take a mild or light roast and try to make sure you have an organic one, preferably from Colombia. And don’t forget to get a grinder and make your own fresh coffee at home! 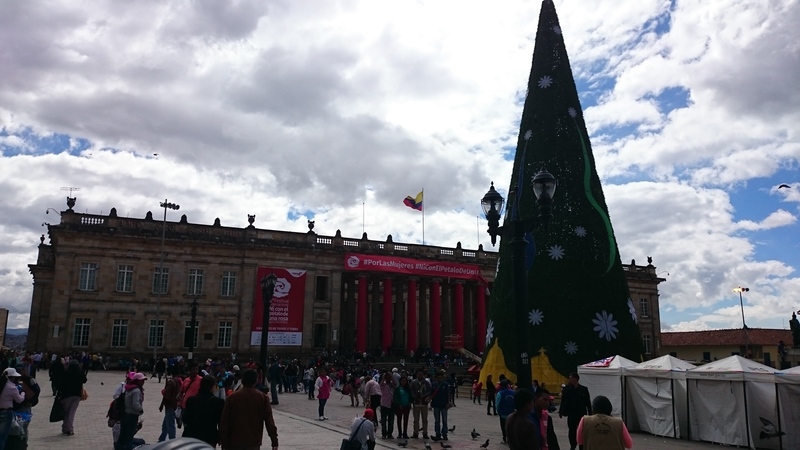 My experience might not reflect those of other foreigners who come to Bogotá. As my wife is Colombian and from Bogotá, this provides surely for a very different experience. If you consider though to move to another place, have an adventure, be ready to learn Spanish (in case you don’t speak the language already), I think Bogotá is definitely a place where you can have great opportunities and a good life. At least that is what I can claim about my three years here so far!